We decided to try something new here over at Casas Fumando. During some of our daily chatter where Tony usually makes fun of Canadians and Moose and I defend my great country, we came up with an idea. Sometimes we revisit some cigars that we previously reviewed or smoke some that we don’t really have plans to type up a full review but we still want to share our experiences with everyone. So we came up with the idea of a periodical “Quick Draw”. The idea here is just to give a couple short paragraphs on a cigar we recently had the chance to enjoy. They could be something we reviewed a long time ago and have some new (or the same) opinions on or perhaps something new that surprised us but we didn’t review. We’d also love to hear everyones thoughts on some of these cigars or perhaps one that you’d like to hear an updated opinion on? Let us know if you like this idea and if we should continue with it, if the feedback is good, we’ll keep it going! 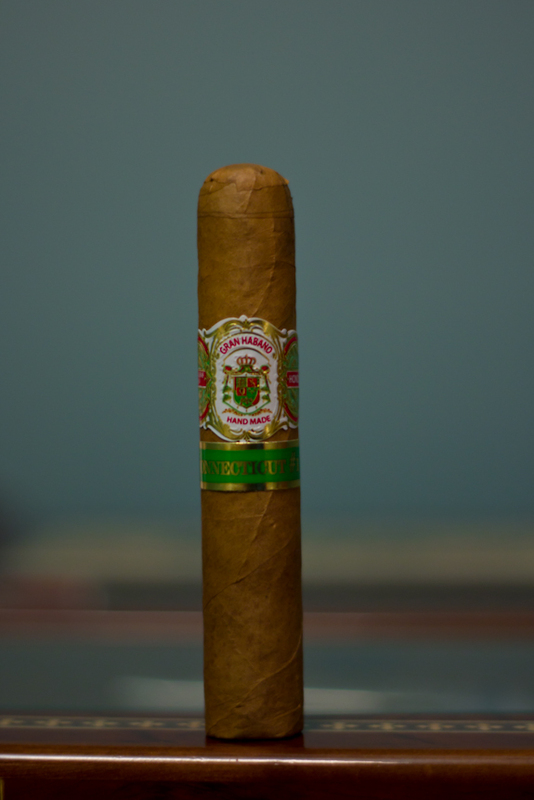 Not too long ago Tony picked out a Gran Habano cigar to review, namely the G.A.R. Opium S.T.K. That review sparked a little discussion between Tony and myself and even came up in the comments from some of our trusted readers. It seems that both Tony and I usually enjoy the Gran Habano cigars that we smoke but for some reason we never really seem to buy them or smoke them more often. Well, after that discussion I came across a box of the Gran Habano Connecticut #1 cigars and decided to splurge on them! I actually also tried these before on one of Blind Reviews and really enjoyed them, but for some reason I never bought any of them afterwards. So I picked up the Rothschild vitola(4.5 x 50) as a good size to enjoy while taking the dogs for a walk or even as a good driving cigar. They also offer a Lunchbreak vitola(4.5 x 40) which would also be a good choice for a short smoke, especially in these darn cold Canadian winters! So what can you expect? At a price of of around $3 – $4 a stick, these are a very good Connecticut cigar to choose in a market with lots of Connecticut competition. Smooth creamy flavors and lots of cedar dominate this cigar that offers a mild and balanced experience. 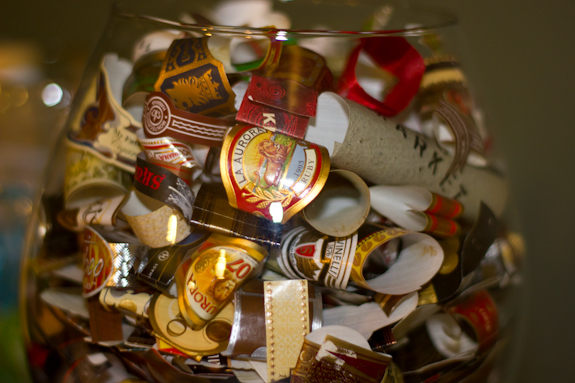 There’s no harshness near the nub and I find the wrappers to be a little more resilient than a lot of other Connecticut’s I’ve enjoyed. I’m glad I sprung for this box and would definitely buy more to keep on hand as a trusty and fairly priced Connecticut cigar. So it’s been a while since I have done a Cuban cigar review. It’s not that I haven’t been smoking them, in fact, shortly after New Years I found just enough spare time to sit back and enjoy this heck of a pairing. 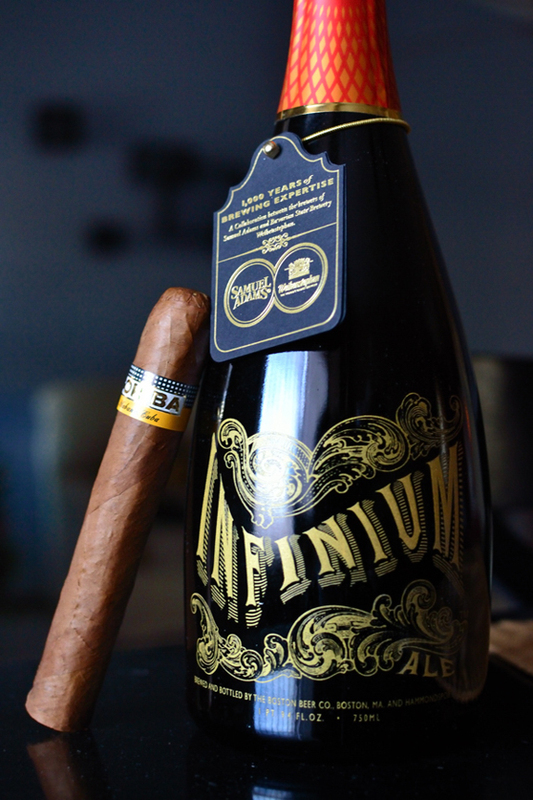 Cohiba’s Siglo VI with some Samuel Adams/Weihenstephaner Infinium 2011. This Siglo VI actually originated from the same 2006 dated box as the review that I did last year (you can see this review here for comparison). I actually have a few of these left so I have been trying to ration them, and only smoke them when I have the time, and I am in the right frame of mind. I am one who believes that you should smoke a cigar when you crave it and not save that “special” stick for that “special” day cause quite frankly, that day may never come. Anyways, back to the information. The Cohiba Siglo VI is a Cuban puro, blah blah blah, 6×52 blah blah blah, and it runs anywhere between $20 and $50 a stick, depending where you are able to get them of course. The Siglo VI is the epitome of a great Cuban cigar through and through. The cigar boasts of salty, cedar flavors mixed with some smooth and sweet tobacco and honey flavors, and just a few added citrus notes to make things interesting. The burn, like most Cuban cigars is ugly, but manageable, but I didn’t have to touch up or relight. I’m not one that really ages my cigars. I smoke them as often as I can, but this Cohiba, while already well-aged, added another notch in its belt over the course of the last year since I did the review. I stated that early on I began getting some strong pepper flavors on my tongue and lips. Not in this last Siglo VI, in fact the cigar in general really smoothed out making each of the flavor change-ups really blend together. I really wonder what a fresher box of these would taste like. Have any of you tried this cigar? How was the age on it in comparison to your thoughts? As for the beer, I won’t go too far into it since I will be pairing it with a full review soon. But if you can find it, DO IT! High alcohol, custom “champagne ale” style beer brewed by Sam Adams which was in cahoots with the oldest brewery in the world and one of my favorites, Weihenstephaner. This beer was actually brewed under the German purity law and was straight up, one of the best cigar/beer pairings that I have EVER HAD! The GH;s are a great quick smoke. I had a few of these on hand this summer at the cottage/beach. As for the Cohiba, I haven’t had the IV but I do have a few sticks left of the 2s. The box date was ’10. I had one a few weeks ago and it really mellowed out compared to a year ago when I had got them. I found that the sticks were sometimes hard to get through as they became really harsh toward last third. I feel like I can actually get the most out of them now than when I first received the box. Thanks Dan, glad you like the concept! The Monte #2′s are by far one of my fave Cubans. I actually just got a box from 2010 a couple months ago and they are smoking fantastic, no harsh or charred flavors at all. I plan to put it in one of these future Quick Draw segments since we already have a full review of an older box. You got it exactly right Jake! That’s the plan, just to share some quick thoughts on a larger variety of cigars! I had a couple Brick house cigars but it was awhile ago, they aren’t easy to find in the Great White North. Maybe Tony can track some down to do a write up for you? If not, I’ll add a few to my next online order! I can find ’em for you guys. SPOILER ALERT! I wasn’t a fan. But I haven’t had it in a very long time! So you never know. I’ll keep you posted. I’ll have to try out the regular GH lines, since I’m a fan of the G.A.R. white label and Azteca. Great idea to have some shorter reviews interspersed with the full ones. I think it would be nice to see some dual reviews too, to see how each of you perceives the same cigar. And definitely try a few more GH sticks, a fairly overlooked brand as I mentioned. Yeah, I’ve read some pretty nice things about their core lines, and the pricing is right up my alley. I did try the Gran Reserva #3, which I really enjoyed, and the Cabinet Selection, which sucked. Yes I like it, good idea, looking forward to ”reading ” some more. That Gran Habano sounds good. the GH is definitely a tasty Connecticut, especially for the price. Give them a try and let us know what you think! Like the concept guys…definitely think you should stick to it. I used to be a religious Siglo IV smoker but have heard great things about the VI so definitely need to try it. As for Monte’s…had the Petit Edmundo this summer…that was a great stick…have smoked a lot of #4’s but hear so many good things about the #2’s that I need to pick one up. Also have smoked a lot of Brickhouse…good value smoke…saw that sampler pack here at my local B&M for about $40CDN. Paul, once you smoke a No 2 there’s no going back to a No. 4. Even the Petit Edmundo clearly knocks a No 4 out of the park for me. glad you like the concept and thanks for the comment! I have to agree with Daniel, by far the No.2 is the king of Cuba and the No.4 is ( sorry too many bad ones) the sewer rat, when friends come back from Cuba with No.4’s, I now just politley say W.T.F. are you kidding me !! Daniel does not agree with me on on my 2nd favorite Cuban, the Montecristo Open Master Cigar, but the recent rating in Cigar Aficionado that gave it 92 points, tends to make me think I might be on the right track with this cigar as well, leather, cofee bean and spice a real beauty eh ( my Canadian touch ). The only other Cuban Cigar I would consider rating as high as the No.2 would be the Montecristo Open Regata torpedo, alas I have only tasted one and could not find them on my last trip to Cuba. I am sure this will all change if I ever get to try a Cohiba BeHike, but till that day, stick with the mouth watering No.2’s and Daniel and I will leave those second place choice’s up to your different mouths and different taste buds. We were actually gonna make this post a short comic strip featuring the life and times of the latest price winner from Casas Fumando, Corey! But alas we decided not to, maybe some time in the future if either of us magically develop the ability to draw… My artistic range with a pencil doesn’t go beyond a somewhat malformed stick man!